Lumbini, the birthplace of the Buddha, was located in 1890 after being untraced for 1,500 years. At the excavation site in the Maya Temple, are the ruins of a monastery and a pool. There are ruins of a stupa at Sravasti as well. Kusinagar is where the Buddha finally attained Mahaparmirvana. Amongst the ruins are the Mukutbandhan Stupa and a beautiful statue of the reclining Buddha. At Gorakhpur, en-route to Kusinagar, there is the Rahul Sankritayan Museum with a collection of thangka paintings. An inscribed relic casket was dug out of the ruins of a stupa at Piprahwa, now identified as Kapilavastu. Sarnath, where the Buddha preached his first sermon in the Deer Park, contains the most impressive remains, as well as a modem temple. The Dharmarajika, Chaukhandi and Dharnek stupas are outstanding. There are also the remains of a monastery, and the beautifully polished Lion Capital of Ashoka. Sarnath contains a rich library and at the Mula gandha Kutir Vihara there are excellent frescoes by Kosetsu Nosu. The Sarnath Museum, not far from the site, contains some of the finest specimens of Buddhist sculpture. Morning transfer to railway station to board Shatabdi exp. For Lucknow. One of the most important place of Buddhist pilgrimage is Lumbini, located near the Nepal-India border. This is where Gautam Buddha was born to a royal family in 556 B.C.E. Many auspicious signs accompanied the Buddha's birth, including the sprouting of the bodhi tree. The great Buddhist ruler Ashoka visited the site two centuries later, constructing a stupa (mound, usually of earth) and pillar in recognition. Although largely destroyed now, these remain important marks of the Buddha's birthplace. Morning visit Sahet Mahet. Later leave for Lumbini- the birthplace of the Buddha, was located in 1890 after being untraced for 1,500 years, enroute visit Kapilavastu - it was in Kapilavastu's opulent environs, that the holy soul of prince Siddharth (Gautam Buddha) spent his childhood. Here he saw sorrow and pain, disease and death. Then, finally when he saw a radiant happy Sadhu who had conquered all these, he decided to renounce all worldly riches and pleasures to seek truth and embark on the path of salvation. On arrival transfer to hotel . Dinner and overnight at hotel. Breakfast at hotel. Morning leave for Patna en-route visit Vaishali carrying box lunch. On arrival transfer to hotel. Dinner and overnight at hotel. 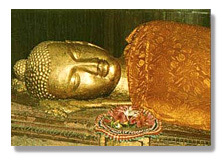 Bodhgaya : The Buddha attained enlightenment at the age of 29 in the town of Bodhgaya in India. After settling under a tree, the Buddha made the resolve not to move until he had achieved enlightenment. After three days and nights of profound meditation this goal was realised. The bodhi tree under which the Buddha sat has been destroyed both intentionally and naturally many times since this time of enlightenment. It has continued to re sprout and is visible today. Morning leave for Bodhgaya - As the place of the Buddha's Enlightenment, Bodhgaya is the spiritual home of Buddhists. It attracts tens of thousands of believers from all over the world. Bodhgaya situated near the river Niranjana, is one of the holiest Buddhist pilgrimage centre's since it was here that Buddha attained enlightenment under the Bodhi tree, enroute visit Nalanda & Rajgir - Like many others in search of truth, Prince Siddhartha, after he renounced his royal heritage came to this city to seek the path of vation. On arrival transfer to hotel. Dinner and overnight at hotel. Breakfast at hotel. Morning leave for Varanasi, carrying box lunch. On arrival transfer to hotel. Afternoon visit Sarnath - where the Buddha preached his first sermon in the Deer Park, contains the most impressive remains, as well as a modern temple. Dinner and overnight at hotel. After breakfast transfer to railway station . Back to Delhi tours ends here .